Offering you a complete choice of products which include freezer room, air blast freezer, frozen cold storage and frozen cold room. 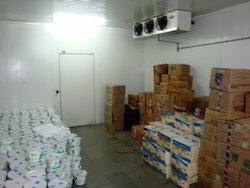 Our Freezer Rooms to industrial demands of storing product at consistently low temperature. 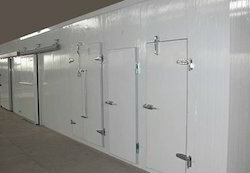 These Freezer Rooms comprise of large Insulated room consisting Individual reach in freezer compartments that are temperature-controlled and maintained by a central refngeratlan system. Our-Freezers offer temperature ranger between -18°C and -25°C. Tbase are equipped thermometer and automatic controller. Other functions (such as setting/checking temperature, defrocing alarms, On Off circles), can be monitored and managed on the LED/LCD display of the automatic electronic controller. We offer top quality and simple to operate Blast Freezers. 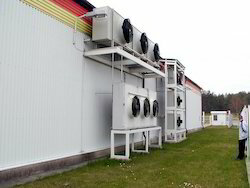 High speed fans generate chilled air to rapidly cool the product. Blast freezing technique crystallizes the water In food rapidly thus minimizing the damage and preserves food at a higher quality. As experts for more than 25 years in refrigeration and controlled cooling, we are proud to introduce a complete series of blast chillers and shock freezers which can be used to build customer satisfaction, Increase profitability, reduce food wastage and preserve flavor over time. Capacity range is from 250 kg to 2 MT. We hold expertise in offering the wide gamut of Freezing Cold Storage in the industry. The offered cold storages are used for special storage of products in the low temperature. Premium grade material is obtained from established vendors for manufacturing these products. Apart from this, these cold storages are designed by our experienced and talented professionals with following the industry quality norms and offered at reasonably priced. We are prominent names in the industry in offering a wide range of Frozen Cold Room. Owing to their sturdiness, high load carrying capacity, excellent damage resistance properties, and dimensional accuracy, these rooms are highly demanded. Apart from this, these find application in various ranges from fruit pulps, sweet corn, and baby corn, cut mango slices, green peas, shredded coconut, and strawberry. Easy to useSturdy construction Robust in design. Looking for Freezer Room ?